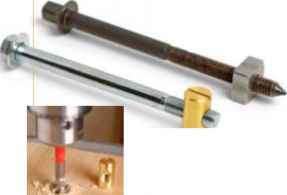 Traditional bed bolts are forged to have a square-drive head that flares out, creating a broad bearing surface on the wood. Regular bolts employ a washer for the same effect. 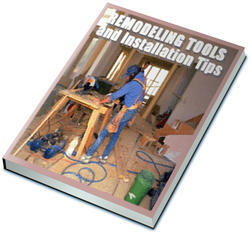 To install both types of bolt, drill a counterbored hole through the bedpost and into the rail, where it meets either a nut embedded in the rail (for the traditional bed bolt) or a nut and washer in a recess. 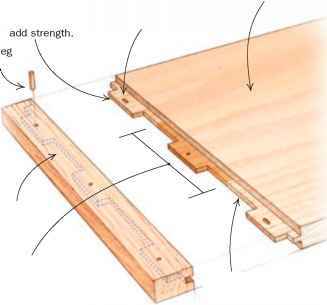 The bolt alone is not enough to hold the rail securely and to prevent rotation, so either a shallow mortise and tenon or a pair of dowels is needed to complete the glueless joint. A modern approach is to use bolts and washers with barrel nuts. This approach does not require a special wrench. Alignment of the drilled holes, however, is critical, and barrel nuts that are large enough to use with %6-in. or 3/s-in. bolts often require IVi-in.-thick rails. There are many approaches to dealing with the bolt hole in the post: The simplest is to treat it as part of a quality joint and to leave it exposed. More likely, you'll want to conceal it, either with a brass cover screwed to the bedpost above the bolt hole or with a simple mushroom-shaped wooden plug, although the latter tends to work its way loose. A new bed bolt. Traditional bed bolts (rear) have stood the test of time, but newer bolts with barrel nuts (front) are easier to install. Simply drill a hole on the inside face of the rail and drop in the barrel nut. How to install home bed bolts? What are bed bolts and embedded square nuts or barrel nuts? How to instal bed bolts?